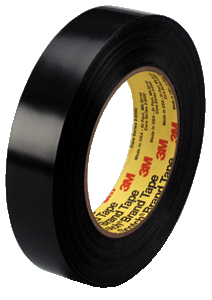 A pressure sensitive tape designed for use in sealing of plastic sheeting, tarps, and shrink wrap for boat storage and over the road transportation. Applies well in cold weather and is resistant to hot and cold temperatures. Is also resistant to common lubricants and strippable coatings. Removes cleanly and easily up to 2 years after application when properly applied.